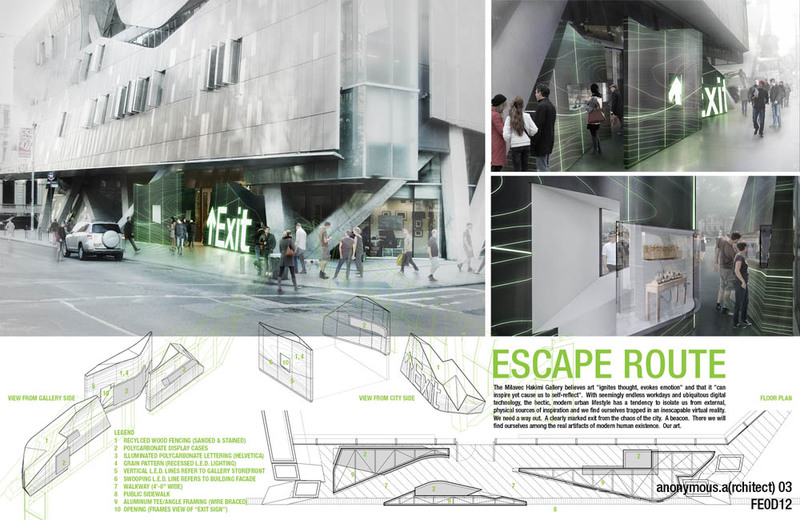 The subject of the 'anonymous(a)rchitect.03' design competition, the Milavec Hakimi Gallery in New York City was interested in investigating the notion of facade as a spatial experience and called for novel proposals to re-program and articulate the interstitial space between the sidewalk and their recessed storefront. The Milavec Hakimi Gallery occupies the ground level of the new Cooper Union Building by Morphosis Architects. Our shortlisted entry which advanced to the second round of judging, focused on the specific mission of the gallery where the belief is that art, "ignites thought, evokes emotion" and that it can "inspire yet cause us to self-reflect". We proposed the consumption of physical art as an escape from the isolation and ubiquity of the digital world we now occupy. We envisioned the gallery as a beacon in the city, a clearly marked "exit" drawing you out of the city, extracting you from your routine and giving you pause. The installation was composed of one element carved by a continuous circulation path that both provides entry to the gallery but also creates a pass-through for an external exhibition. Three objects result from that operation that provide internal display space that is visible from both the interior of the gallery and from the pass-through. They are clad in recycled wood fencing that is sanded and stained to a metallic finish. Subjected to a scale shift, the wood grain is reintroduced as a lighting element. The "exit" text draws directly from typical New York City subway signage.